This app edit fuel mapping which the Fuel Injection piggyback controller Enigma for HONDA PCX125-JF56(2014) model. 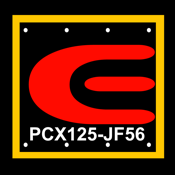 Enigma for PCX125-JF28 MODEL is another App. Other operations of the following Enigma body, I can in a variety of iOS devices. This app need Bluetooth LE.After iphone4s ipad 3rd. - cancel / set the engine speed limiter. - The maximum 2500 micro seconds the engine rotation and throttle position for each fuel injection increase / decrease can edit and write-read. - displayed in 3D graph increase or decrease the amount of fuel. - view the throttle opening and tachometer monitor and water temperature in real time. - The fuel map, showing real-time engine speed, throttle position of the current. - arbitrarily set the rev limit. - the digital acceleration pump. - corrected for the actual Throttle position sensor. - save and create multiple fuel data, you can swap immediately when needed. Pairing is not required. Do not search Enigma in the Bluetooth settings screen. After the Bluetooth to ON in the Bluetooth settings screen to exit the setting screen in the home button, start the app, please do the connection from the "Connect to ENIGMA" app. There is no direct linkage function of the data and the PC version and other smartphones. Please migrate the data via the Enigma.